By choice all lighting is done by paraffin and candle lanterns to preserve the ambience of this special site. Functional, stone clad cottages on smallholding in private valley just off the Drakensberg Gardens road. Each unit is tiled throughout and has 2 bedrooms with bathroom, lounge with fireplace and fully equipped kitchen. Lairds Lodge is an open plan functional cottage on its own plot on the outskirts of Underberg village. ...on the farm "Borreray" is one of the last privately owned properties in the southern Drakensberg. Situated high on a mountain ridge between the conservancy area of Vergellegen and Loteni, the farm has commanding views of the mountains and river valleys on all sides. The Croft cottage is more suited to families and groups wanting more privacy and comfort. The cottage is double story with one bedroom, bathroom, lounge (with fireplace) and kitchen on the ground floor and an upstairs loft with an extra 6 beds. The Hadedah Nest is perfect for campers and hikers, being a one roomed rondavel with 4 beds, gas kitchenette and log fireplace. The Stone Age cottage has been more recently built and is a double story stone and timber built house with a bedroom with bathroom downstairs plus an upstairs bedroom and dorm room with 5 single beds. Located in the picturesque Upper Dargle area of the KZN Midlands, sheltering under the Nhlosane Mountain, this is a perfect retreat for romantic couples looking for a first (or second) honeymoon; a peaceful getaway away from the city with all modern conveniances. Shelter Farm is situated in its own quiet valley on the far side of the Bulwer mountain. 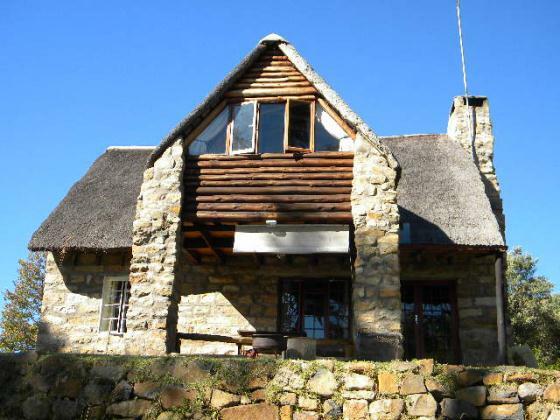 A stock farm with veld and mountains all around, it is the perfect place to get away and just relax or engage in nature based activities such as walking, horse riding (by arrangement), bass fishing, birding or mountain biking in the surrounding hills. Summertime is a very serviceable holiday home in the pleasant village of Himeville. The 4 bedroom, 2 bathroom (sep bath, shower and loo) house has an open plan kitchen / lounge (with fireplace) opening onto a wooden deck on two sides. It comfortably sleeps 8 people with 2 double beds and 4 singles. This beautiful up-market home with 6 acres of rolling lawns is nestled below Hlogoma Hill, which has panoramic views of the entire Sani Pass mountain range. In Summer you can take a dip in the pool or have sundowners on the patio and get a stunning view of the sun setting over the mountain. Winter evenings are cosy around the log fire in the comfortable lounge. We were amongst the first agents to market farmstays and private homes in this area and have always had a select portfolio of places to offer for holiday letting - whether this be a romantic hideaway for two, weekend getaways, rustic fishing and hiking huts, large farmhouses for family reunions, exclusive lodges etc. Laundry Laundry can be arranged by prior arrangement. Cost is per 10 kg load and payment must be made in cash to the maid.